I searched for previous posts for this model, but found none, which is somewhat hard to believe! Therefore, I will do a little write-up on this somewhat famous and well known vehicle, and the Dinky Toys models that Meccano produced. 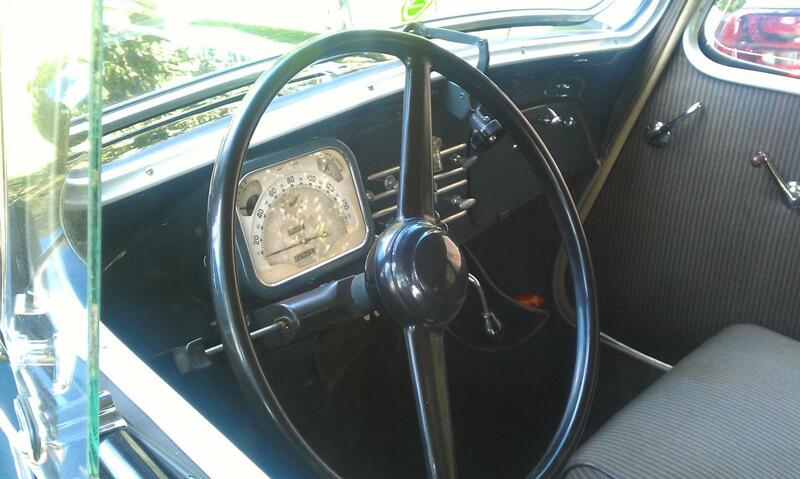 There is much information on the internet about the development of this car, but to summarize, it was initially designed and produced around 1934. At that time, it was quite revolutionary, as it was one of the first production cars to utilize front wheel drive and also independent suspension. 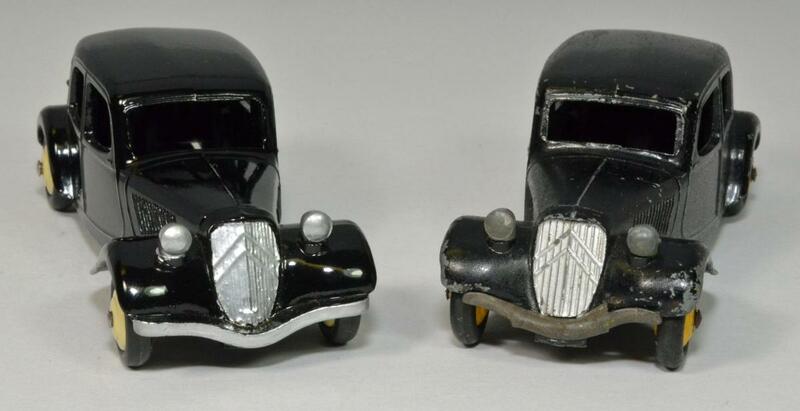 Over the years, many variations and versions were produced, but for our purposes, we will just focus on the models that Dinky copied. 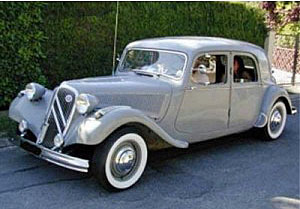 From about 1937 until 1952, the Citroen 11BL had a rear boot or trunk that was not too large. In fact, the spare tire was fitted into a cover that was part of the rear hatch, and was a distinctive styling feature of the car for many years. That also impacted the available trunk space to some extent, so finally, in 1952, Citroen added some length to the boot or trunk, enabling the spare tire to be completely contained within it, while also allowing a bit more luggage room. 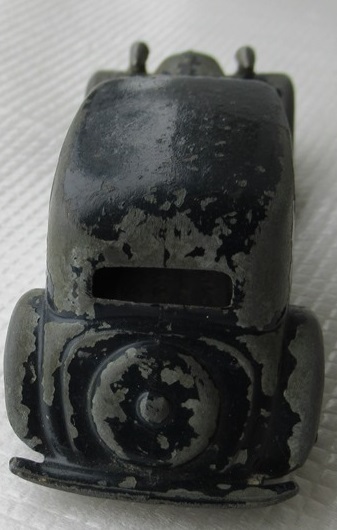 This changed the look of the car, and corresponds to the later Dinky Citroen 11BL, made from about 1953 through 1957. 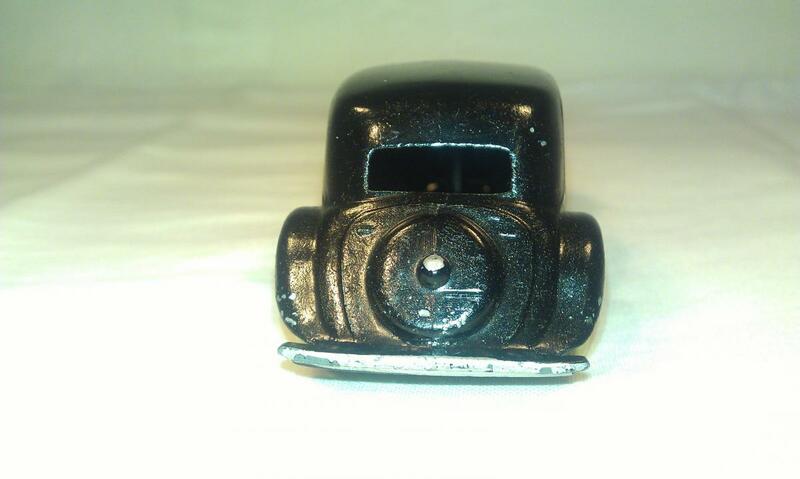 Dinky first made this model in 1949, and at that time, it was designed with the then current look with the spare tire area visible at the rear. 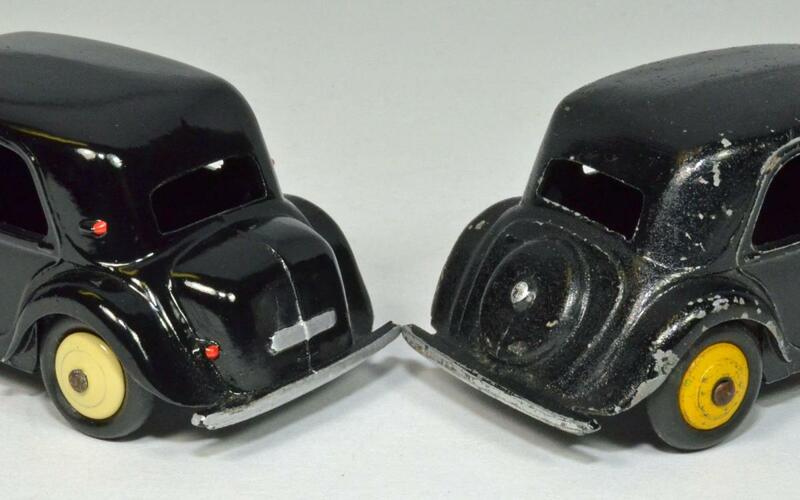 These first models also had a tinplate front bumper, nicely curved to resemble the real one, a baseplate with no model number, and small lettering. This first version also had fewer and larger louvers on the sides of the hood or bonnet, and fewer and thicker vertical bars in the front grill. The first version also did not include the rear taillights, later shown on the rear mudguards and above, on the rear of the cabin. The first model was made in a metallic grey/gold color, followed by the familiar black. For 1949, they also had the zamac solid metal tires and wheels, followed later by the rubber "m" tires with yellow wheels. There are several other small variations that Jacques lists in his Encyclopedia, but I am not going into detail with them here. 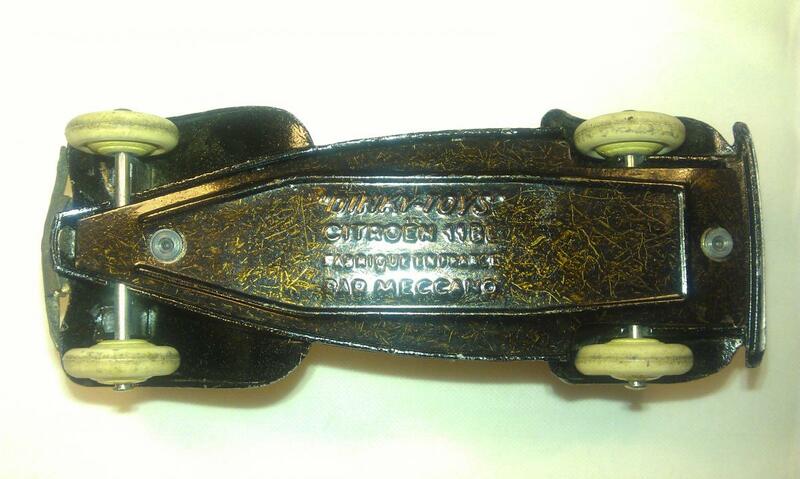 When the new 11BL was announced in 1952, Meccano decided it was time to update their model. So the tinplate front bumper was replaced with a nice diecast version, the spare tire holder deleted, and the lengthened boot or trunk added, along with those rear taillights. The louvers on the sides of the hood were also made much finer and more numerous, as were the vertical slats in the grill. And, finally, the baseplate was changed to reflect the model number 24N, and later, the size of the lettering was made larger. The new model was made in black, with cream wheels, and for the last year or so, was also made in a handsome color of grey, along with white tires. 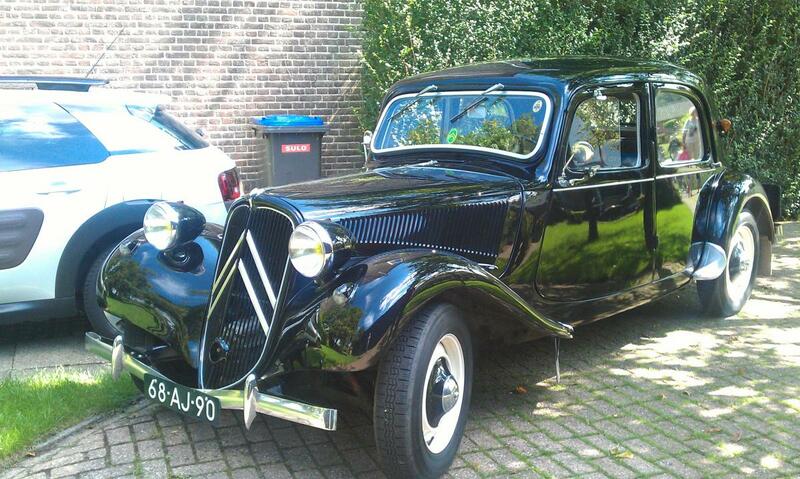 This Citroen never used the polished or chrome wheels, and always came in trade boxes of 6. 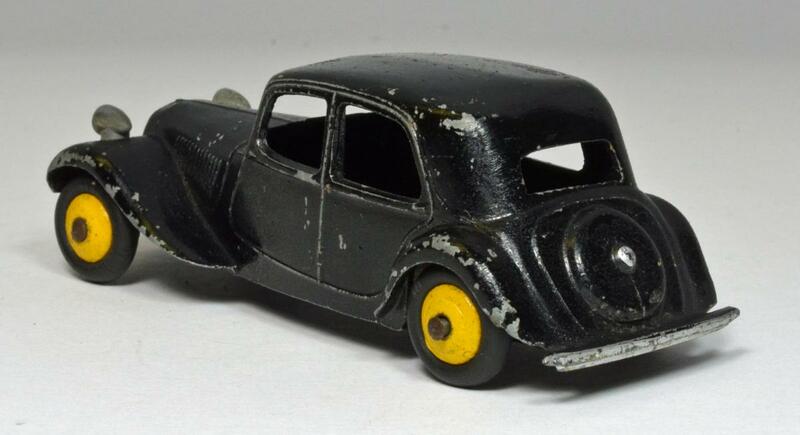 I bought my first Dinky model of this car in 1956, when I was eleven years old. I really liked the car on the display cabinet, but when I asked about buying one, I was informed they had no more. I was discouraged, but then thought to ask if I could buy the display piece....and they agreed! I then had to carefully remove it, as it was wired down, and some damage was done to the baseplate. 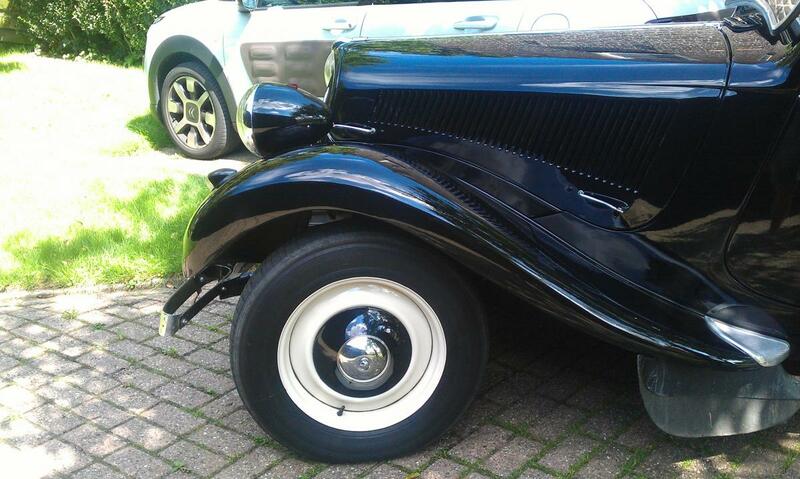 A few years ago, I treated it to a professinal restoration in its original black with cream wheels. 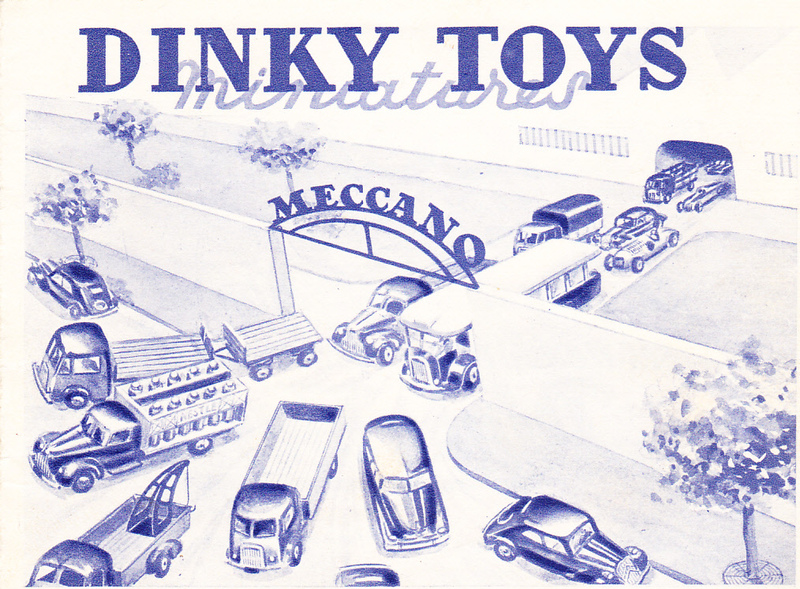 Then in 1958, while visiting a toy store in San Diego, I noticed that they carried Dinky Toys. In looking through their stock, I noticed that they had a beautiful grey 11BL in a trade box.....the last one. So I bought it, and got the trade box as well. I still have both and the model has stayed in very nearly mint condition some 58 years later. 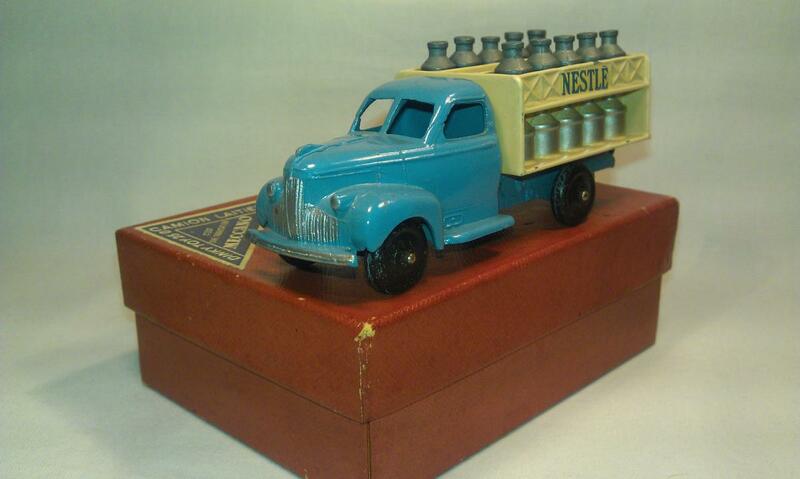 Still one of my favorite Dinky models! 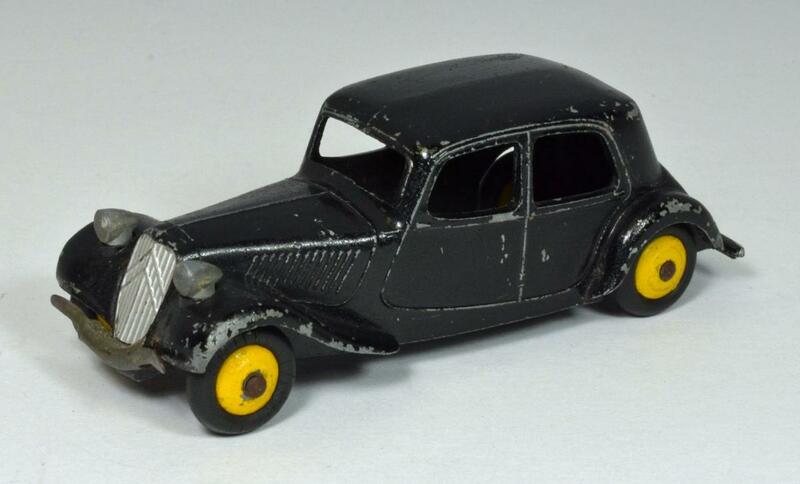 The French Dinky factory really made a splendid model of this beloved car....it was very true to look and scale, and makes a great display piece. 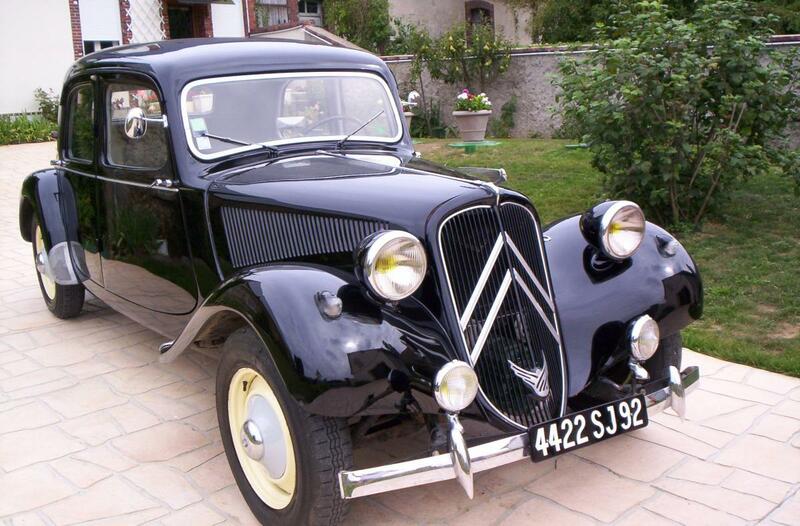 The real car, which was somewhat dated by then, was replaced by the all new Citroen DS19 around 1957. There are a lot of threads to be activated indeed, Terry, and you made a very nice start with this one. 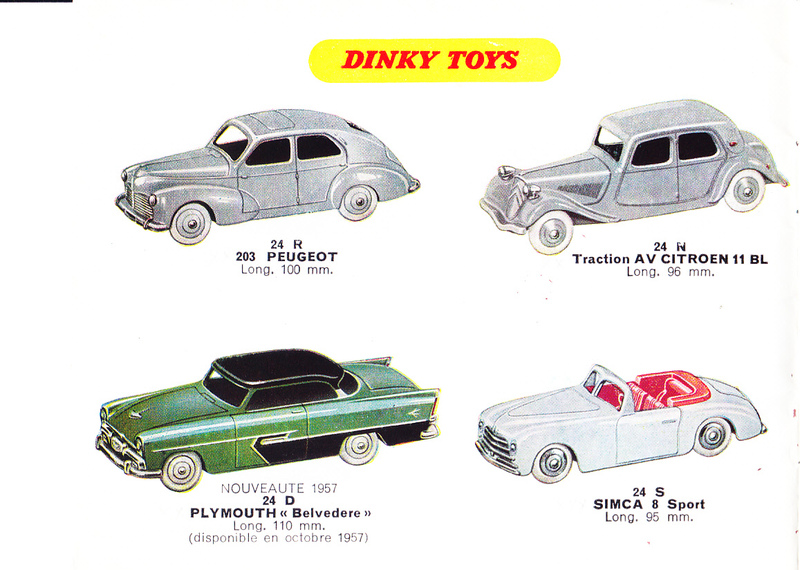 Remarkable that the 'spare wheel version' of Dinky France was considerably less common than the one with the trunk/boot. As a young boy I always found that spare wheel at the rear on the real one much more fascinating and - as far as I am aware - more common than the one with the boot. As it happened, last week I passed a 'convoy' of about ten wonderful Tractions Avant on the road, apparently of the Traction club. What a fantastic photo of you having fun! 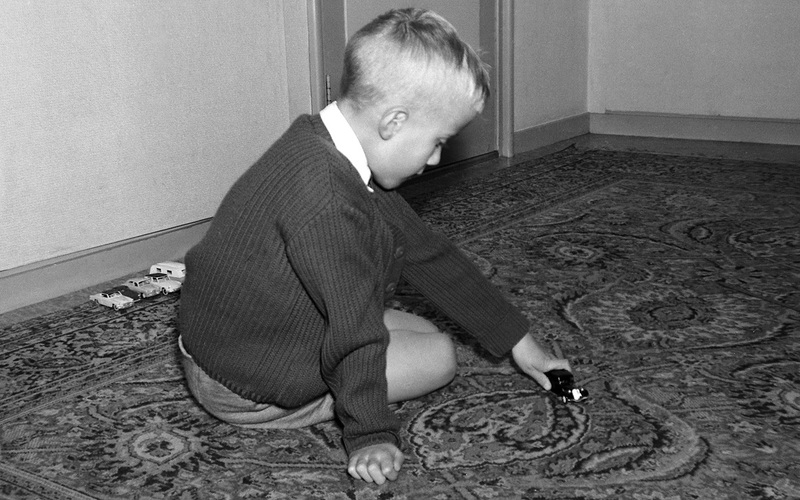 The picture could easily be of any one of us of our age group, typical little boys at play, using just our imagination to turn the sitting room carpet into a main highway, or a racetrack or a construction site! We must be thankful that those little boys are still there inside every one of us, if we only allow them to come out and play! Jan---What a great memory photo of you with that Citroen......memories of our early experiences with our Dinky's are so prized.....very special recollections indeed. 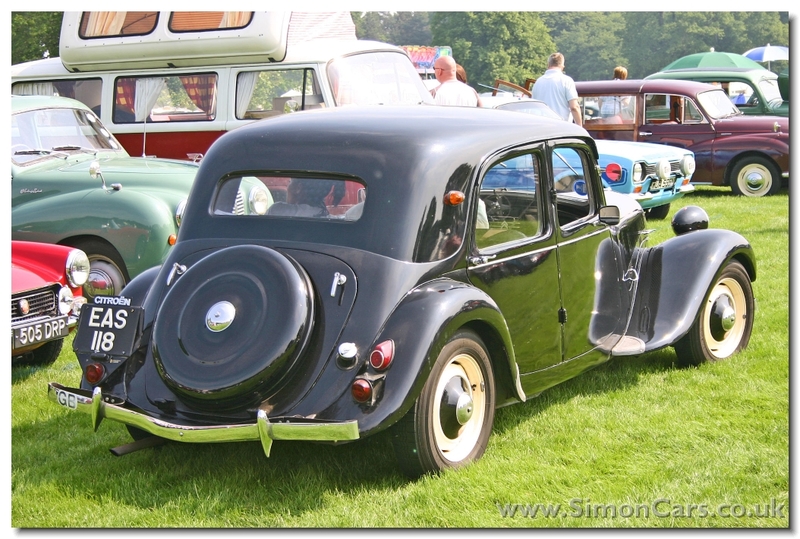 As to you remembering more of the tractions with the spare wheel exposed , on the road, I would suggest that they made many more of that version.....from 1934 to 1952, whilst the trunk version was only from 1953 to 1957. 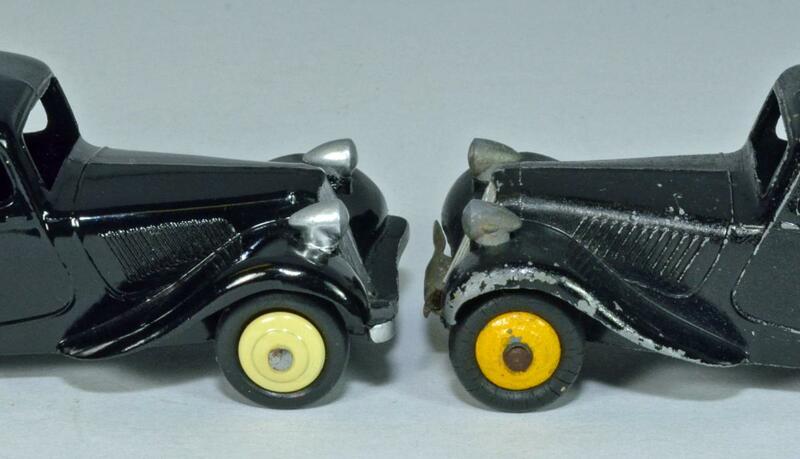 But you are quite correct, in that the later trunk version, in the Dinky Toys world, is far more common than its earlier predecessor. 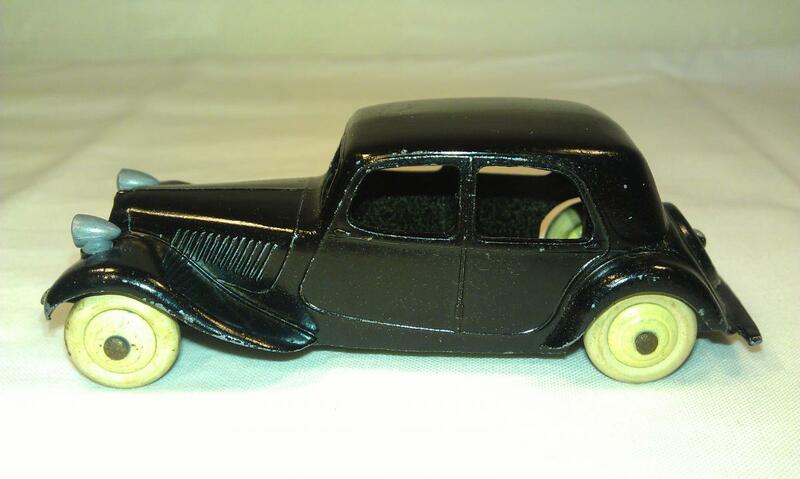 I received this Citroën 24N model 11BL in black. It is the 1st version with a flat spare wheel. In the book of JMR I did not find this model with cream hubs and white tires as wel in the book of the collection Gérard Dulin. Picture 24N Citroën Traction Avant in the book "Collection Gérard Dulin". 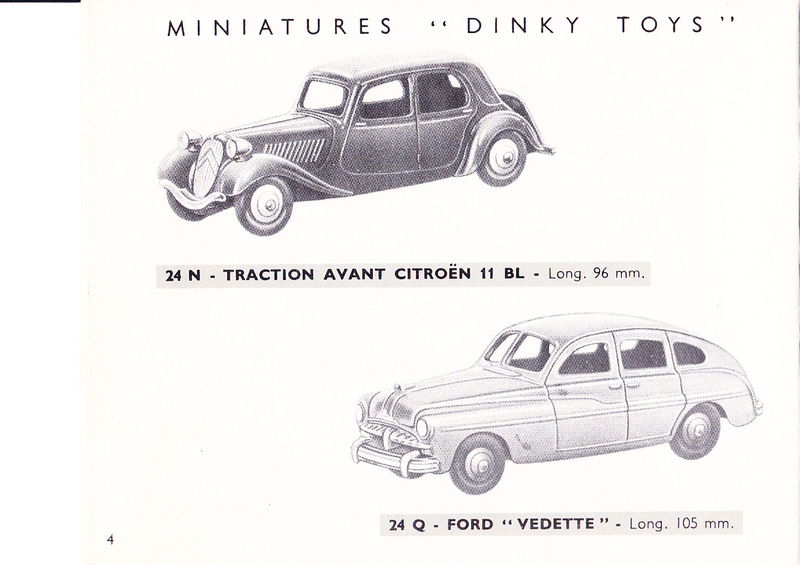 1st appearance in the Dinky Toys catalogue France 1949. 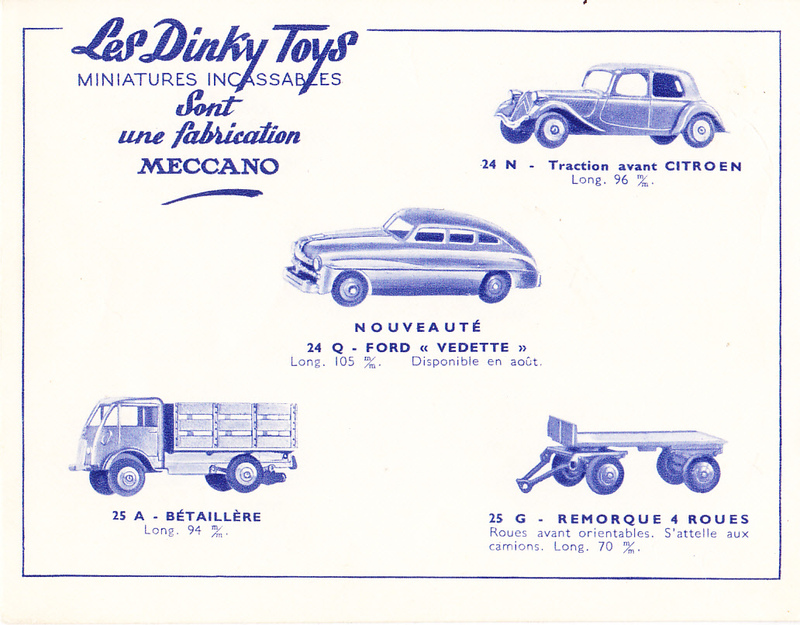 1st appearance in the Meccano catalogue France 1949. 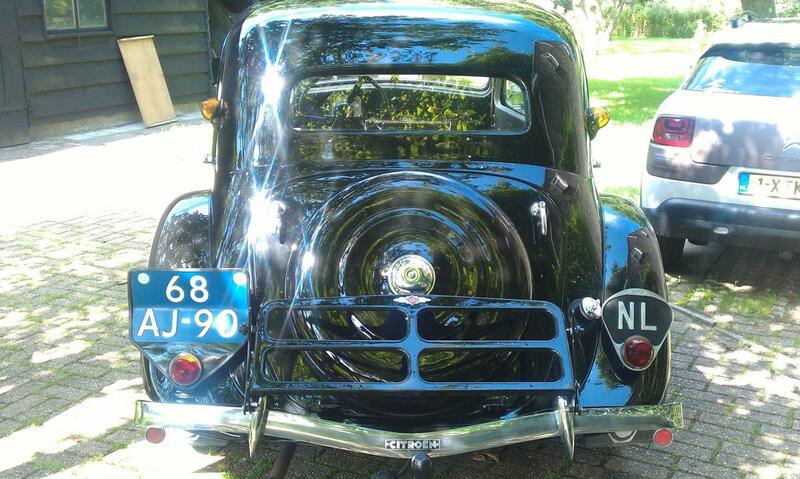 Also some pictures of this Citroën 11BL, built in 1948 with a Dutch license plate. 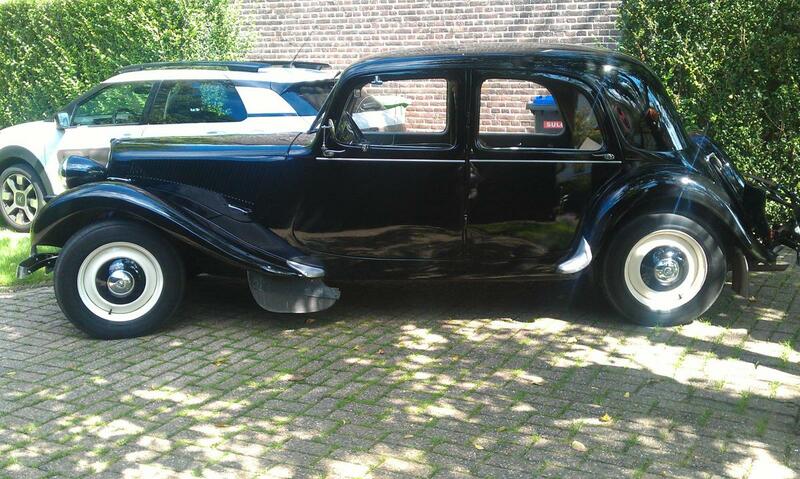 The Dutch owner lives near me and has completely renovated the car. The car has a towbar and the owner goes every year on holiday with a caravan behind the car. He regularly drives this car to keep the engine in a good condition. Jan---A very nice find! You don't see too many of these in that nice of condition, so you must be quite happy. Am assuming you have already seen mine, in an earlier post, which has the more common yellow wheels, and is nowhere as nice as yours. According to Jacques' encyclopedia, this first version was made from 1949 through early 1953, when the second version with the rear boot was introduced. 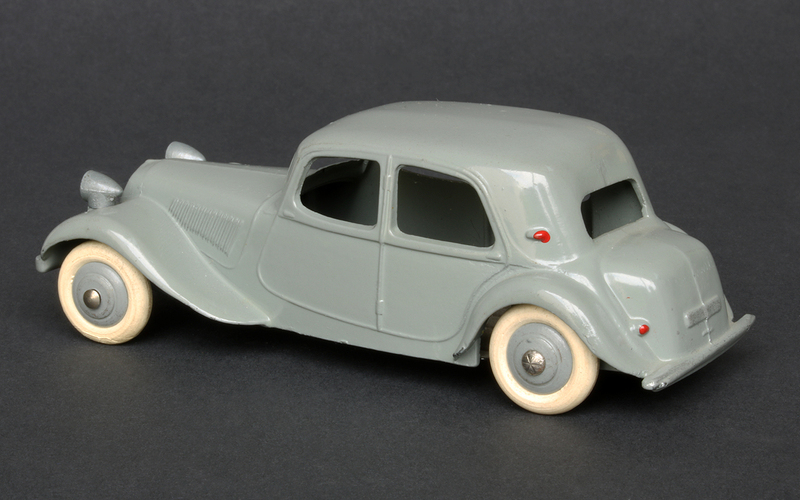 There were 3 varieties of this early model, and the last apparently did come with either yellow or cream wheels. 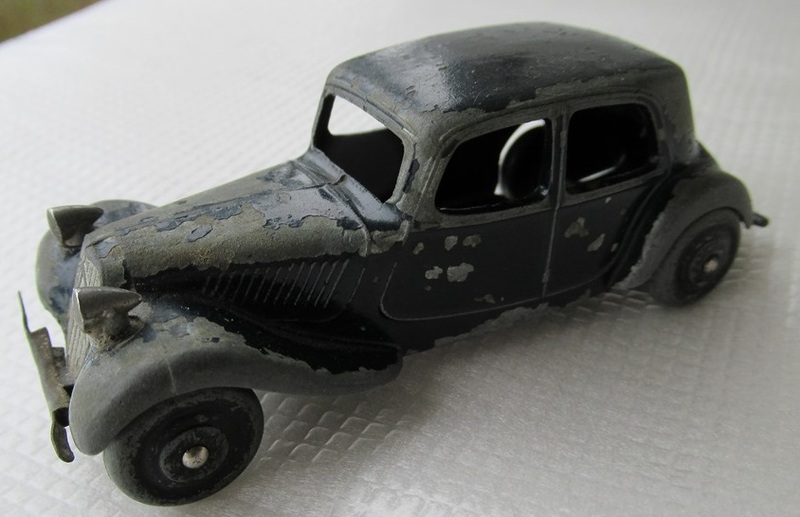 If it was a very late model, it is possible that it came with white tires, but I am not sure the date French Meccano started using those; could very well be replacements. If you have the second, later version, with the boot, you will notice many other differences: there are fewer louvers on each side of hood, and the vertical slats on the radiator grill are also fewer. 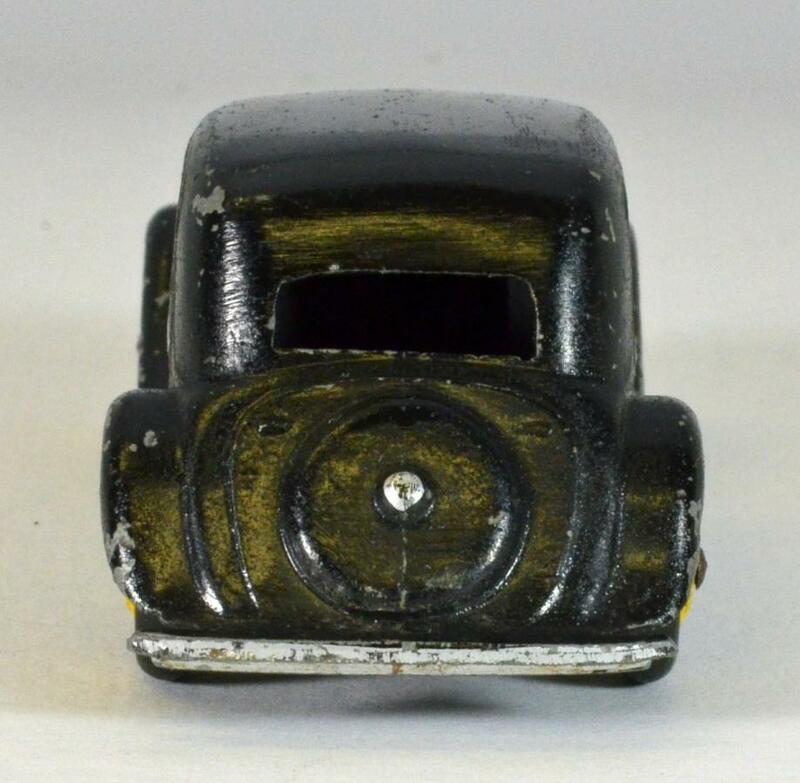 The rear tail lights are also missing, and of course the front bumper is now diecast with the car, while earlier it is a seperate tinplate piece. But very interesting to see how French Meccano changed and adapted this model to the also newer real car. 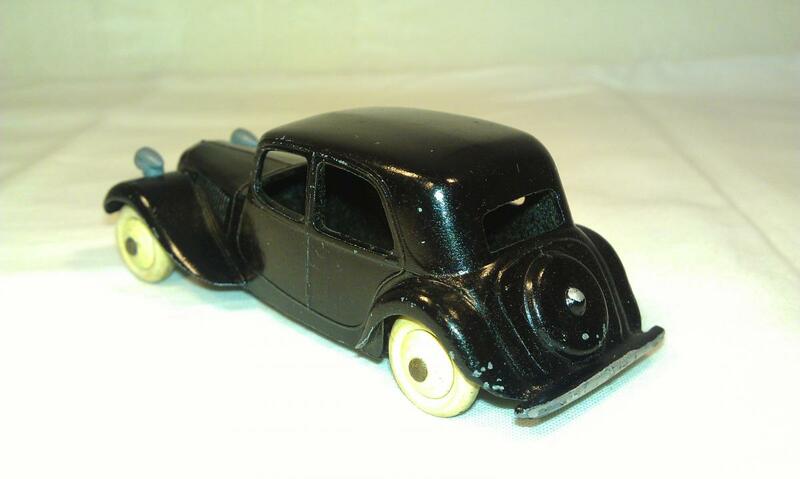 As you know, I received recently the very first version of this Citroën, in dark blue color, with zamac wheels. I am very happy to have found one, even if a lot of paint is missing. It's so hard to find ! Here under, some photos of this version and my complete team. Richard. Congratulations with this acquisition. 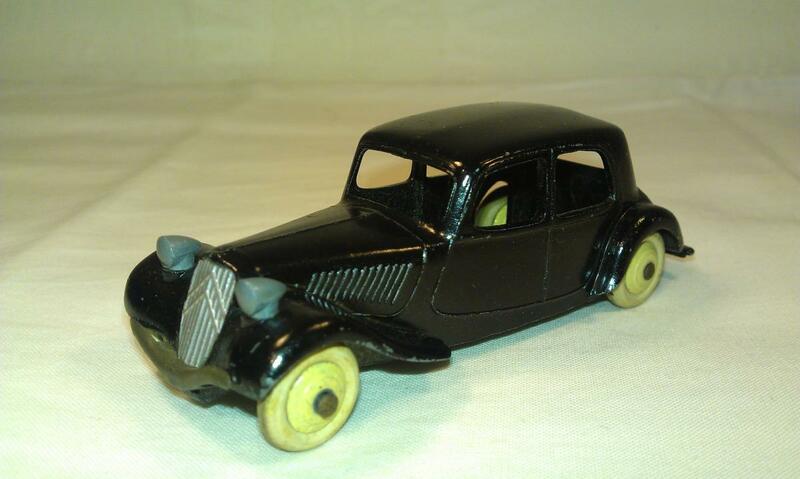 Indeed very difficult to find with these metal wheels and then you are satisfied with some paint loss. There is too much tampering with these models due to repainting. I experienced that myself. Now you know for sure that he is authentic. 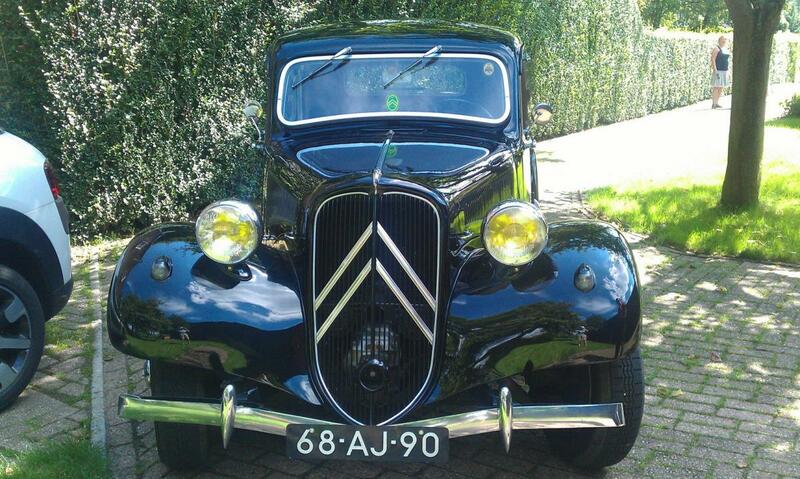 They are the old beautiful Citroen models of the past, which were seen on the roads for so many years. I love this car very much and it is one of my favorites. 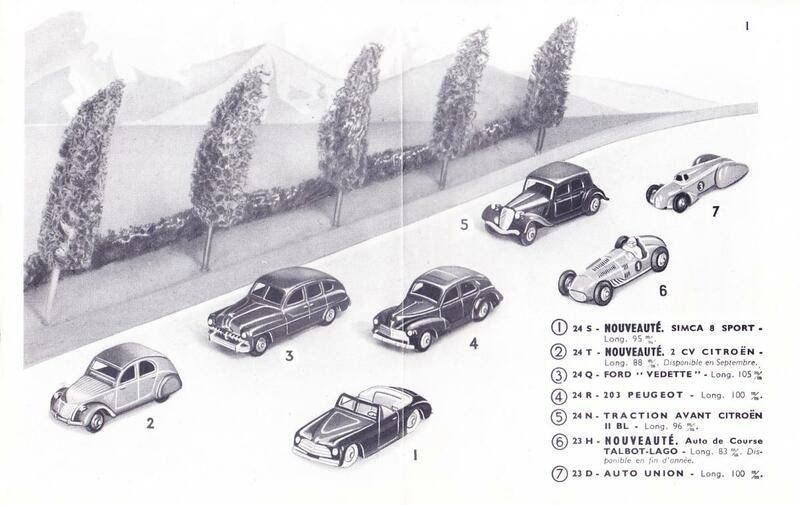 Looks like your Citroen collection is already almost complete. 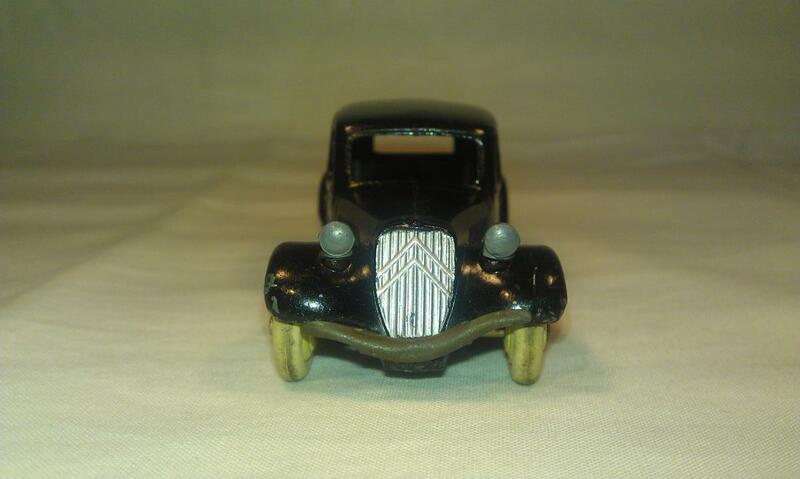 I add a picture of my 25o Studebaker Camion Laitier, 1st version, also with metal wheels and closed winding hole. Also very hard to find in this condition. Jan--Your Nestle Latier appears to be in wonderful condition, notwithstanding how old it is. So hard to find an original one that nice...congratulations indeed!